It's not so long ago that the first graphics card touting Nvidia's GTS 450, the Asus GTS 450 TOP, passed through the TechRadar labs. When we first checked it out we quite liked it but as we said at the time: "we'd have hoped for a price tag a little closer to the £100 mark". 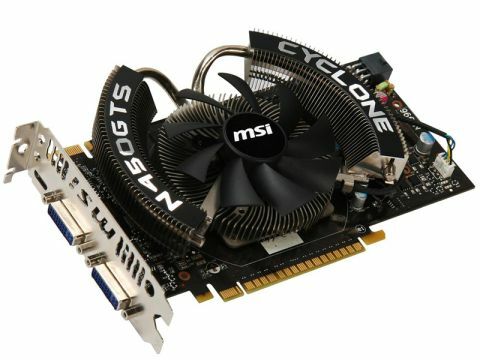 Well, someone was listening, because MSI's overclocked N450GTS Cyclone is within a tenner of our target. It runs at 67MHz above stock speed for a card of this ilk, with a healthy 434MHz boost to the memory speed, but the main feature is the wide windmill-like cooler. It's whisper quiet and drops the temperature down to just 27 degrees Celsius when idle. The card itself is small and requires just a single six-pin power connector, and is more or less still price comparative with AMD's HD5770.